I was part of a group of speakers invited to speak at Walgreen University. When I asked about the fact that they ranked very high in merchandising and very low in customer service it became apparent that I hit a nerve. Truth is I like Walgreen Company. I admire what they have done with their Super Stores but what I can’t understand is how poor their customer experience is in relationship to their merchandising experience. And after their reaction to my suggestions that customers needed to be treated better, I went back to see how they were doing with a huge television promotion they launched on Celebrity Apprentice. In late May, Walgreen was featured as the final project for the Celebrity Apprentice. 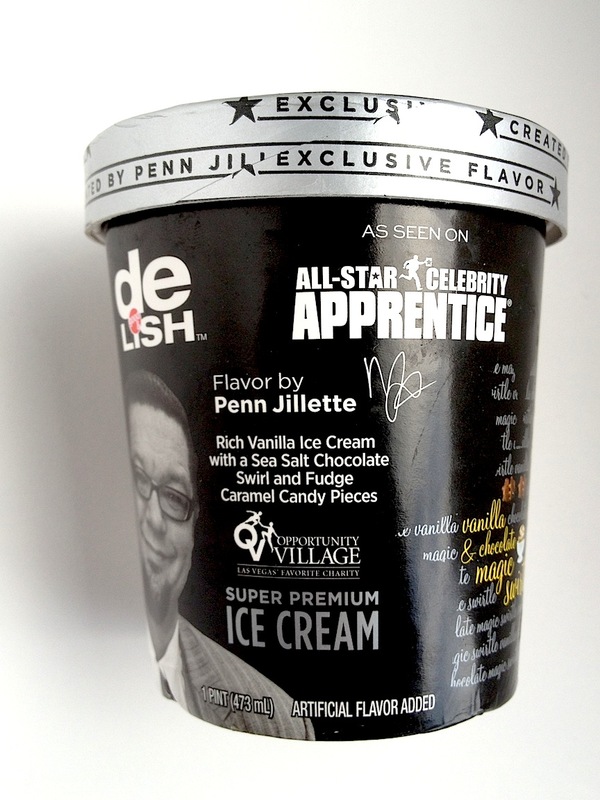 Trace Adkins and Penn Jillette were tasked with creating a new ice cream flavor for Walgreen. At the conclusion of the episode Walgreens had an ad focused on getting the viewers to purchase one of the two new flavors. Penn’s was ‘Vanilla and Chocolate Magic Swirtle” and Adkins was “Maple Macadamia Mash Up.” Each celebrity was playing for their favorite charity: Penn for Opportunity Village, and Adkins for American Red Cross. The winner would earn $40,000 for their charity. 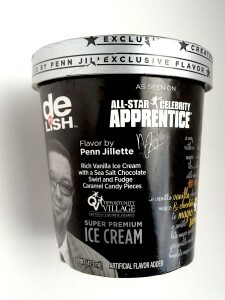 Three days after the Celebrity Apprentice there was only one of the two flavors. The price was $2.29 Seven days from the initial introduction the price went to $4.49. 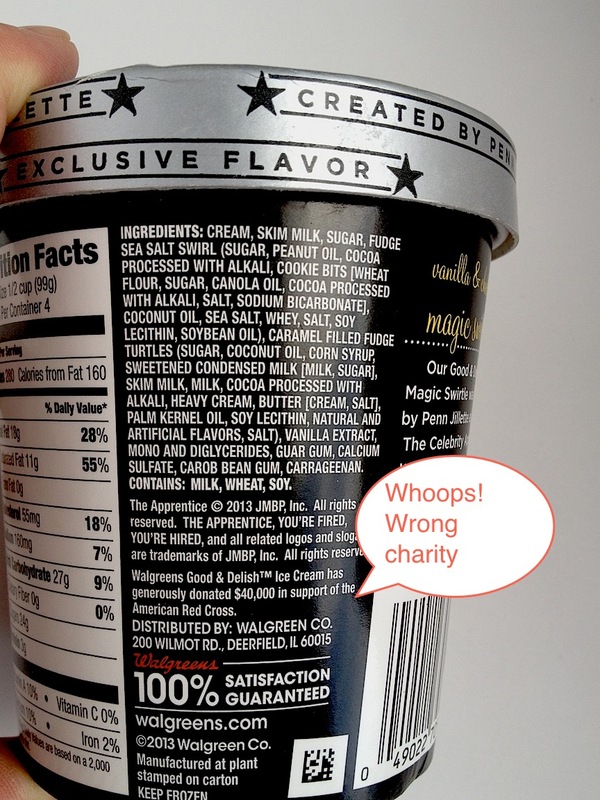 I have included photos from the two ice cream cartons and you will see that Penn’s charity did not get the $40,000 according to the carton which stated, same as Adkins $40,000 went to the American Red Cross or a total of $80,000. 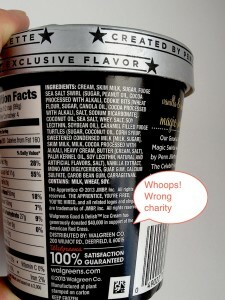 If Walgreen Company does not pay attention to details, maintain communication with the store managers that should train their employees, focus on better customer service, then all the super premium ice cream will not dilute the bad taste customer will have that these details demonstrate. My prescription is that Walgreen stands on the corner of happy and healthy and re-writes their prescription for wellness. Bad service, poor proof reading, and a defensive attitude when these matters are called to their attention require a shift change. I want to say it again. I like Walgreens and think that they could function better if they understood what the customer expects.